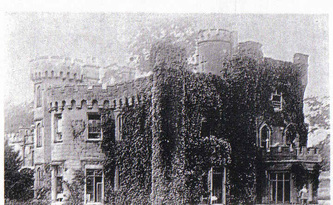 In this section are a range of early paintings and surviving photographs of the Castle - dating from the 1860s to the 1920s. 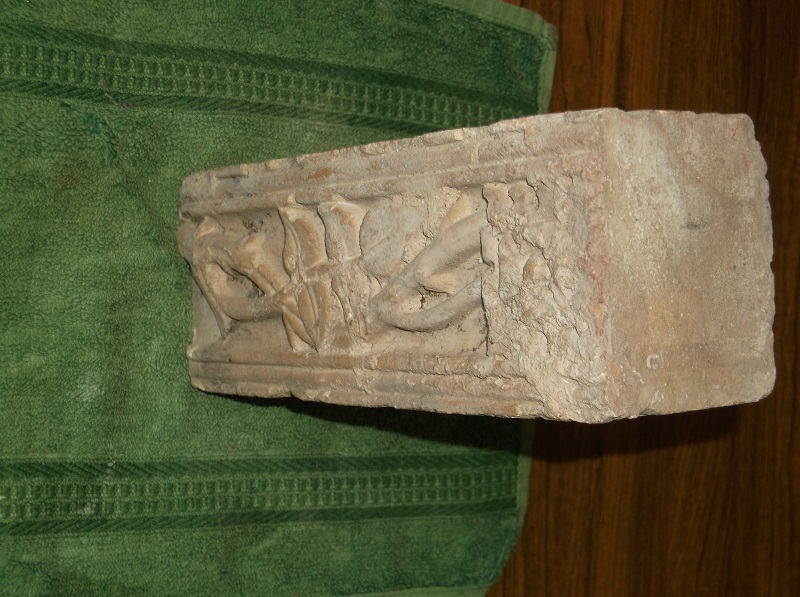 This section also includes some images of Castle artifacts that have appeared more recently: such as the Weddington Castle Lion. 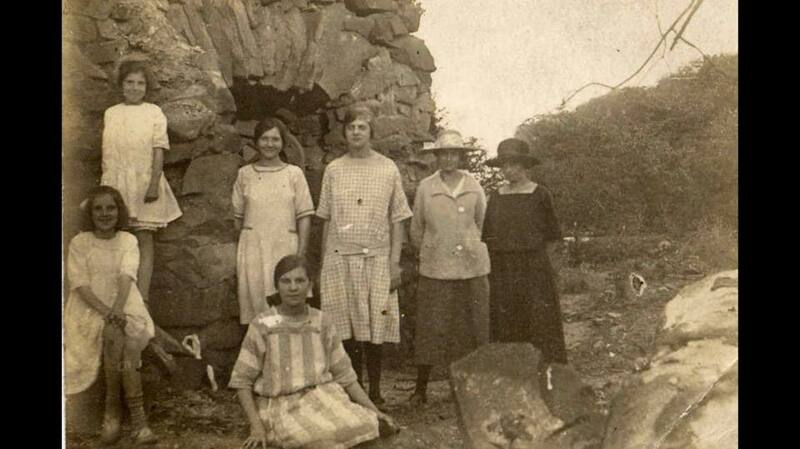 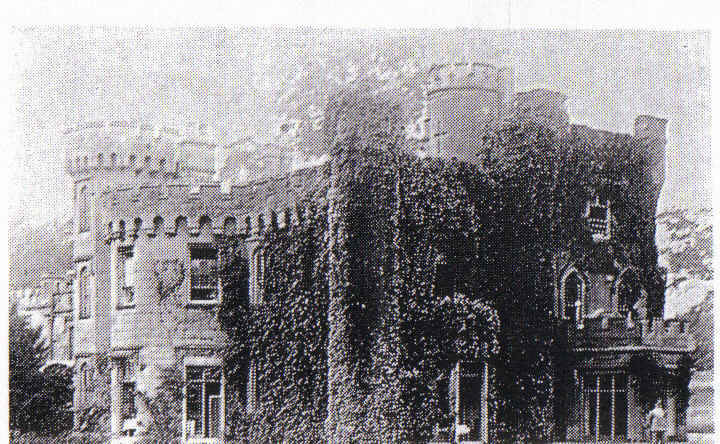 You can view images of the Castle during its time as a Red Cross Hospital from 1916 - 1918 at this link. 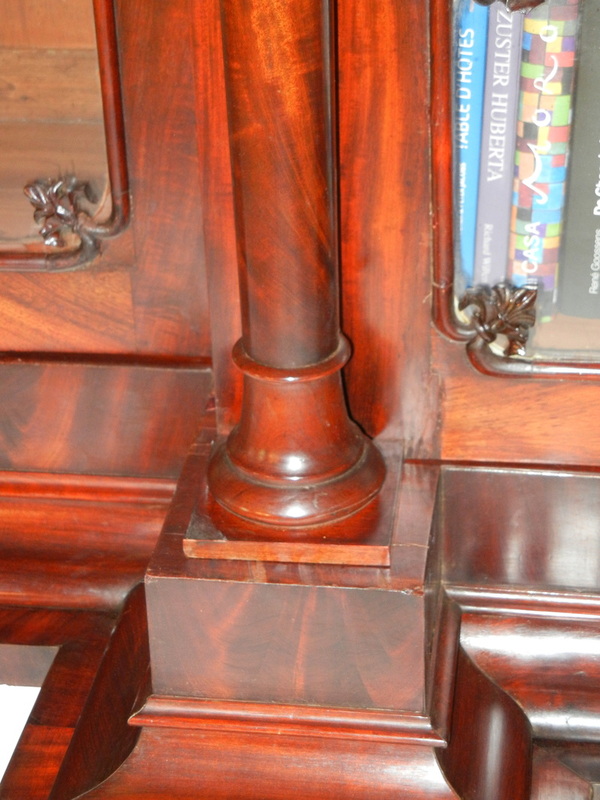 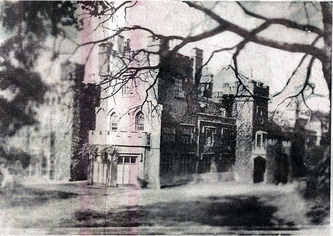 These feature unique images of the Castle's interior. 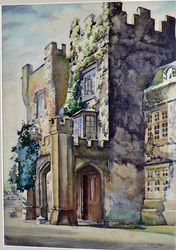 Oil on board by artist Aubry Mann who lived in Collycroft and was a stalwart member of the Old Meeting URC in Bedworth. 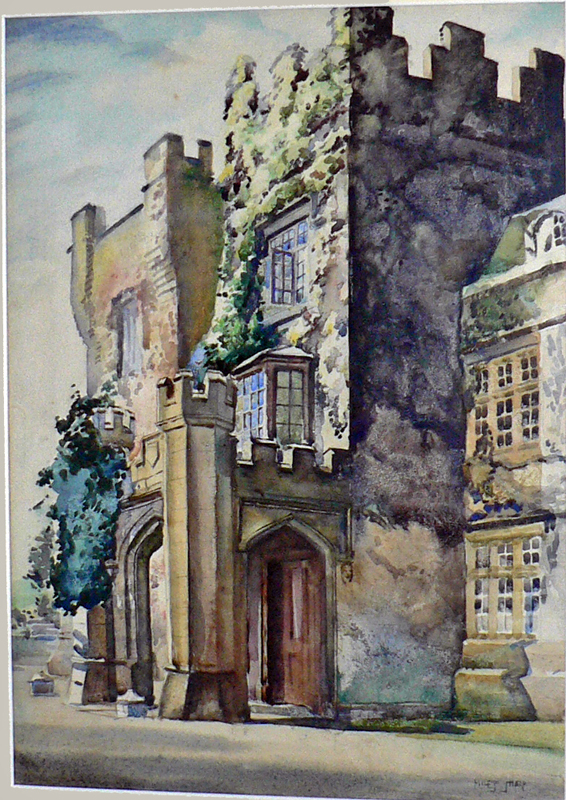 He was a talented artist who did a lot of watercolors in his retirement of local scenes. 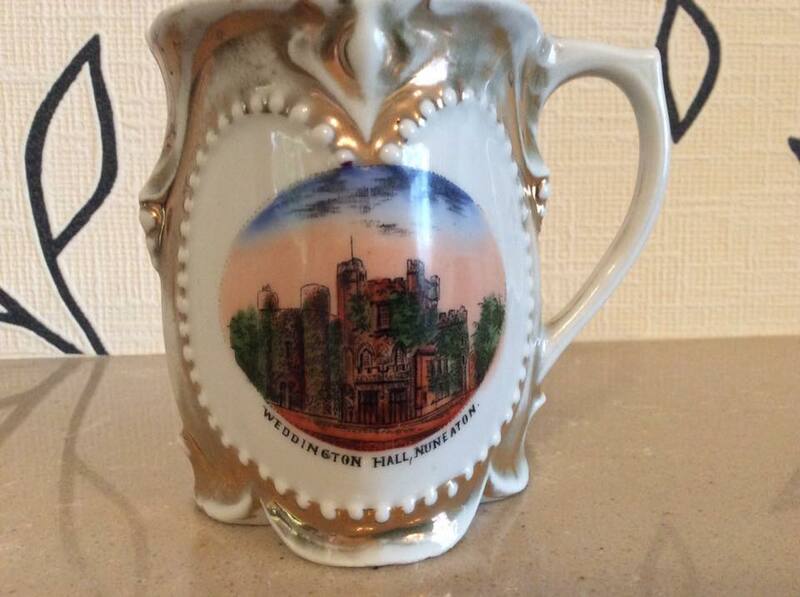 Mostly they were done in the 1970s and 1980s. 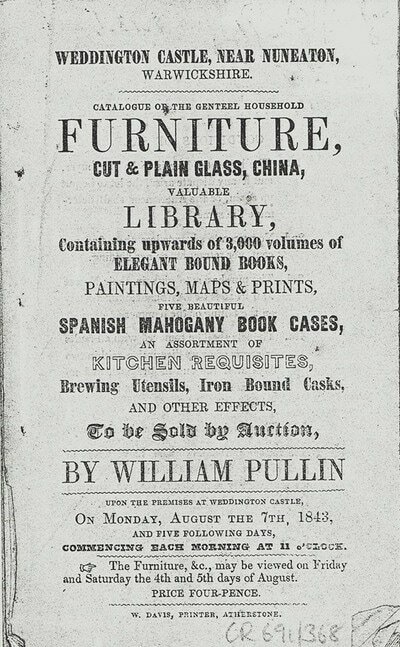 Aubry also wrote a history of the Old Meeting and one of the Sunday School and he published a volume of poems as well.. 40 x 50cm [c] Nuneaton Museum and Art Gallery. 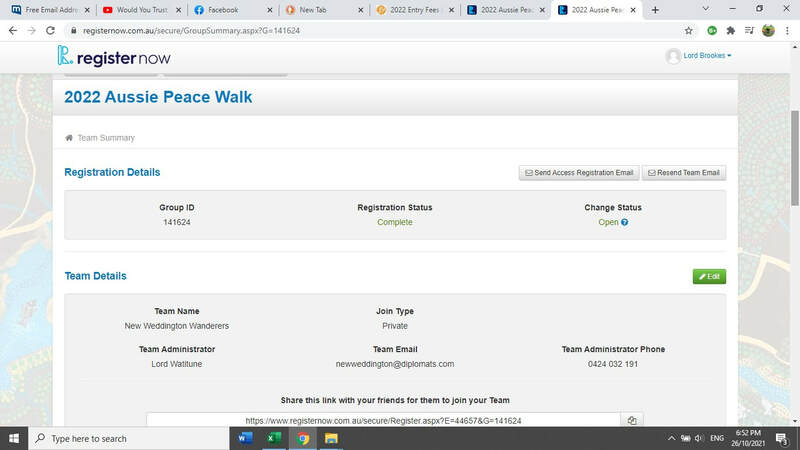 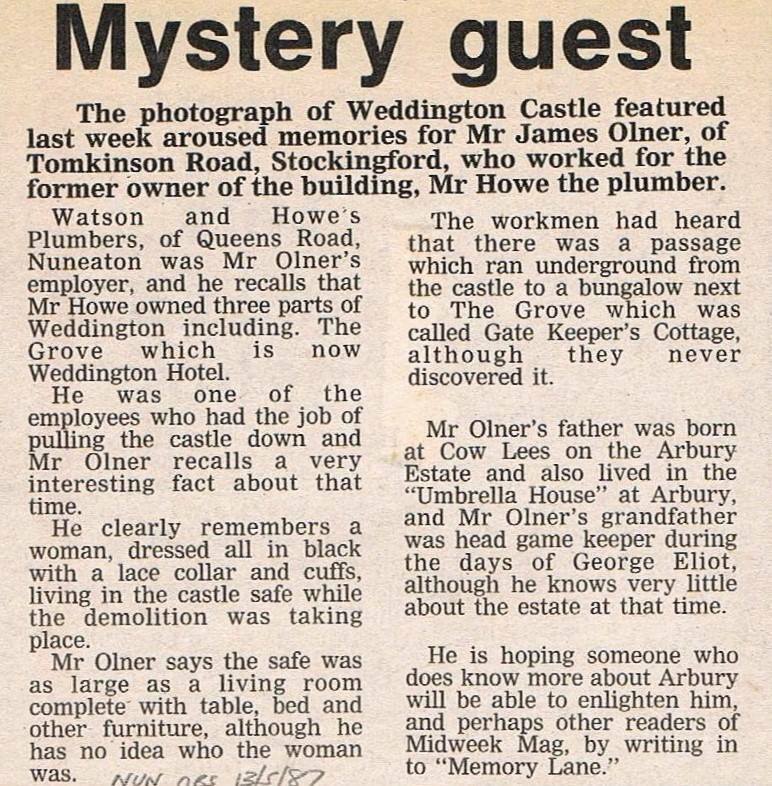 Thanks to John Burton for the extra info on this. 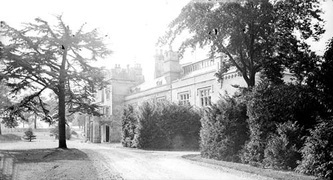 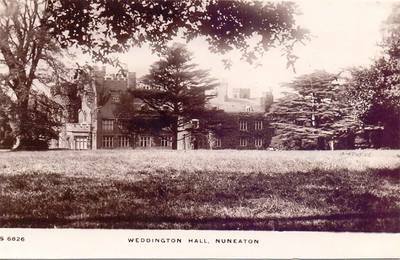 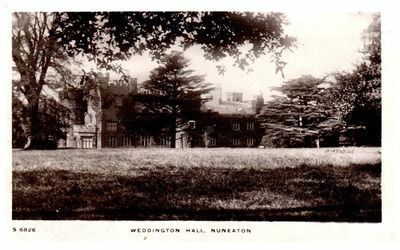 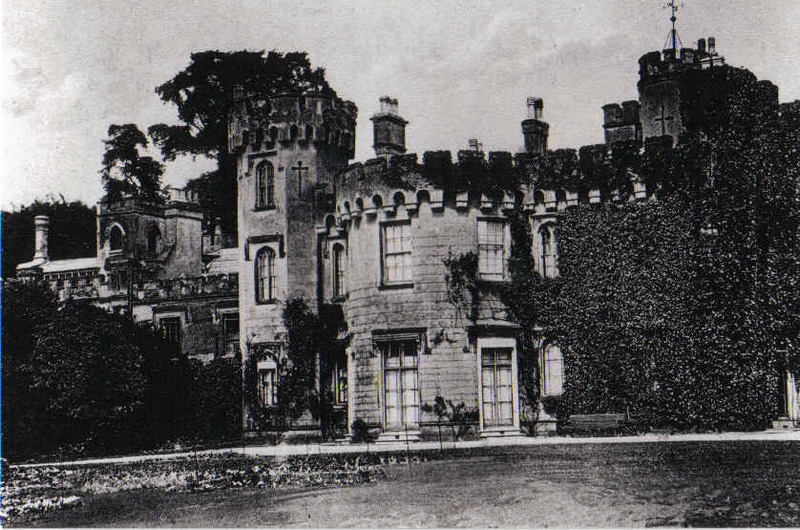 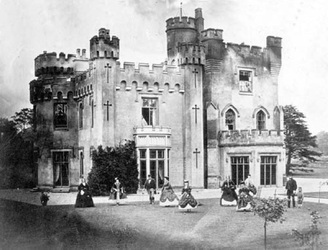 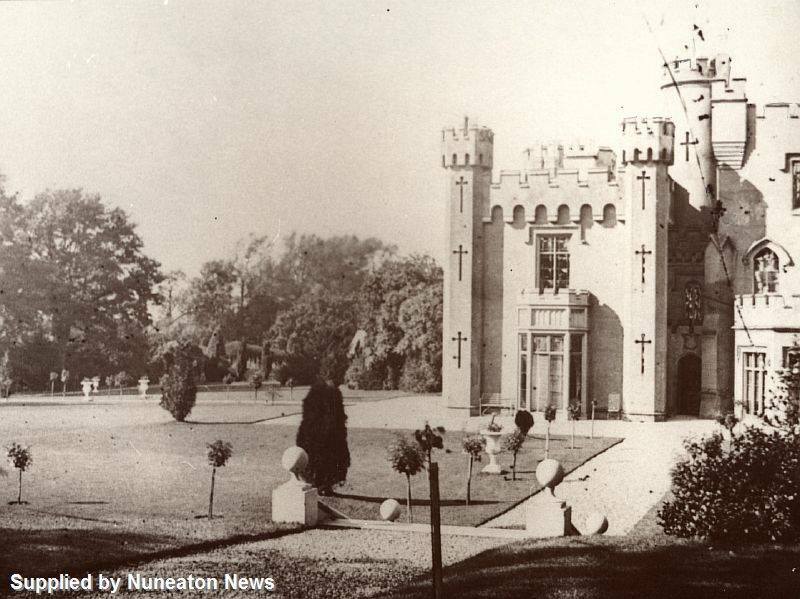 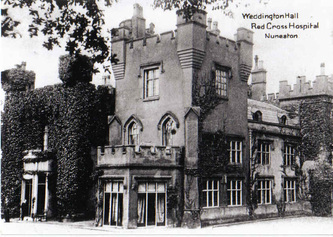 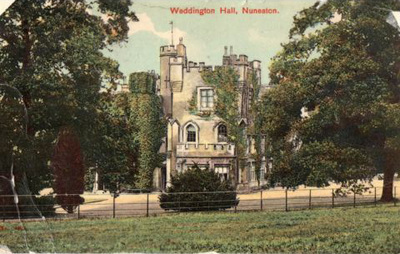 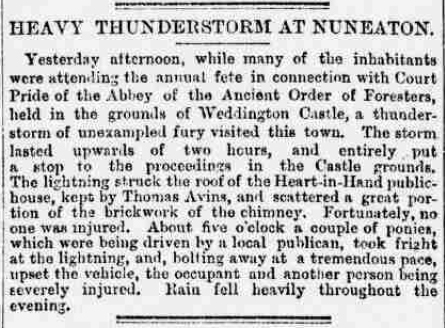 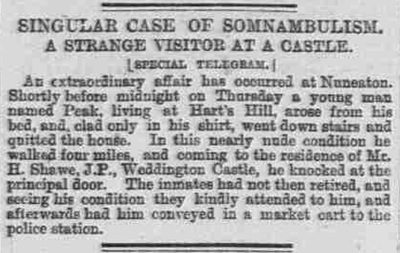 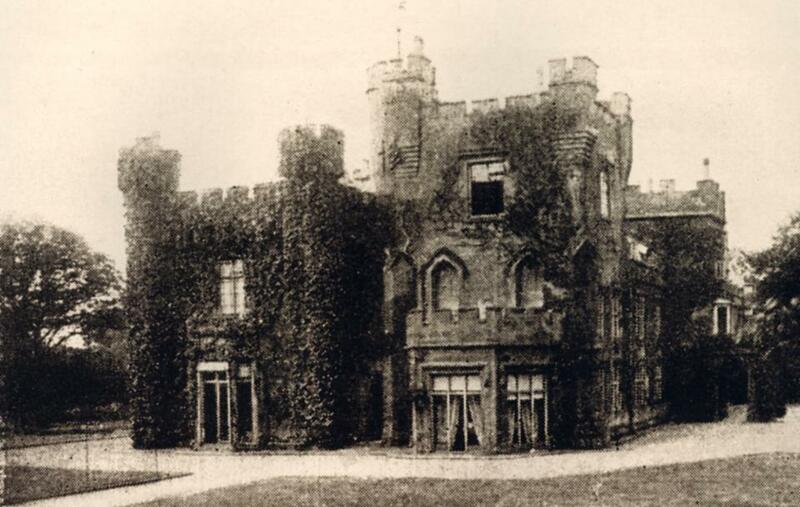 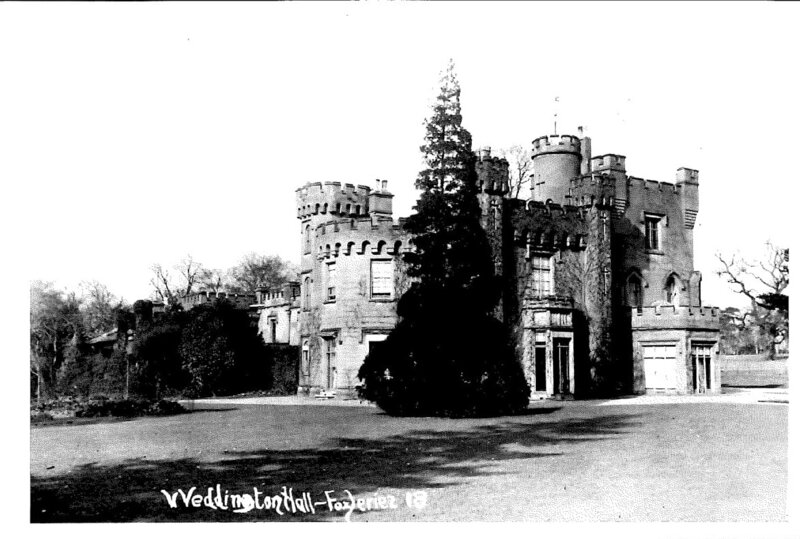 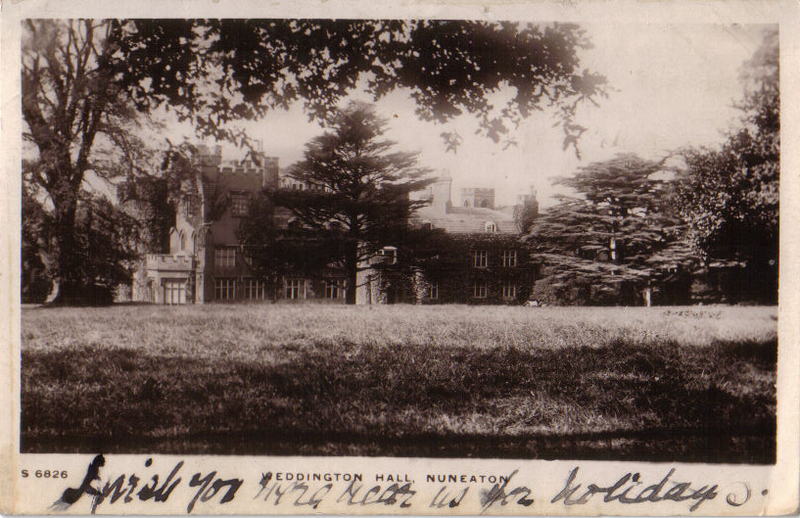 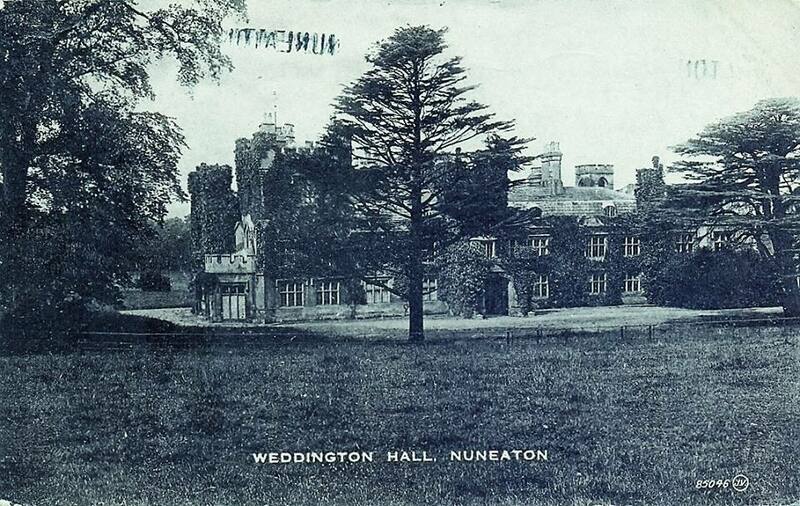 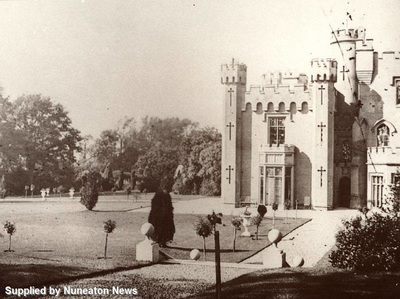 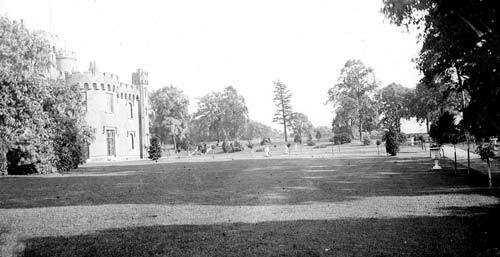 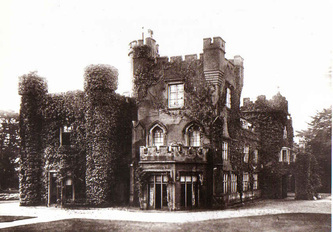 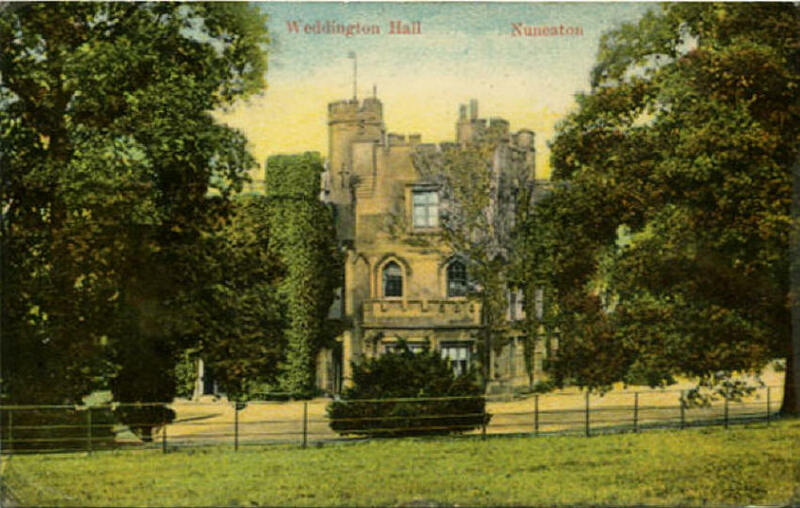 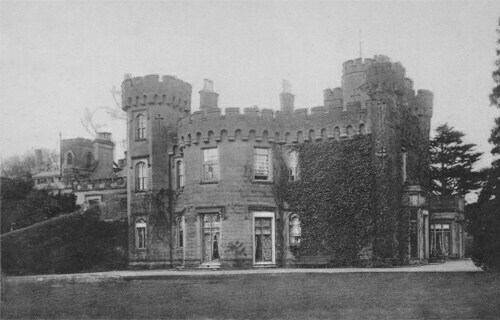 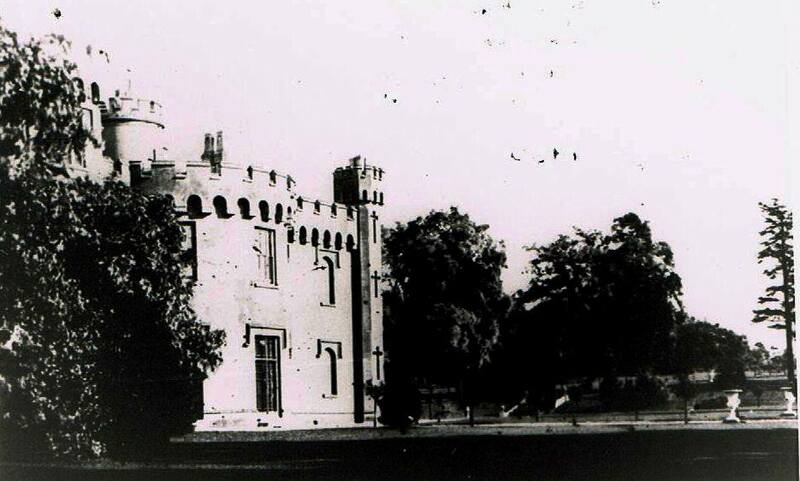 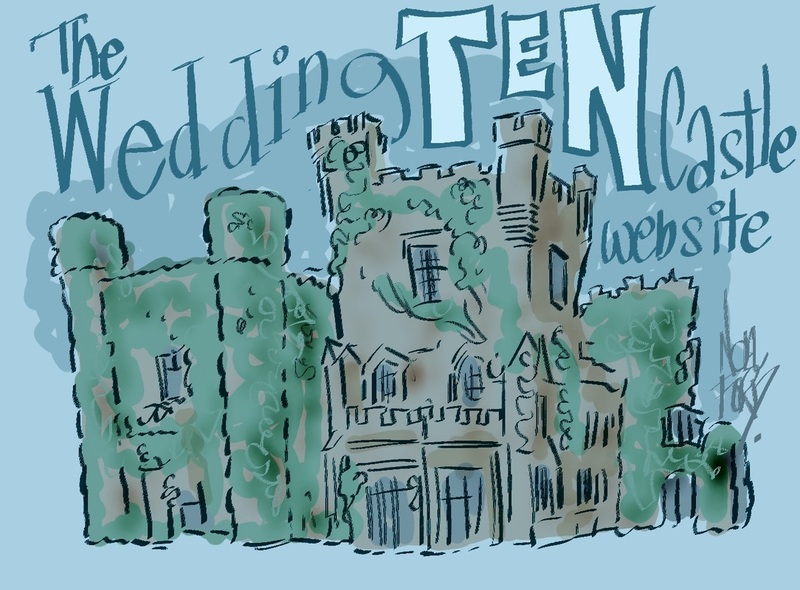 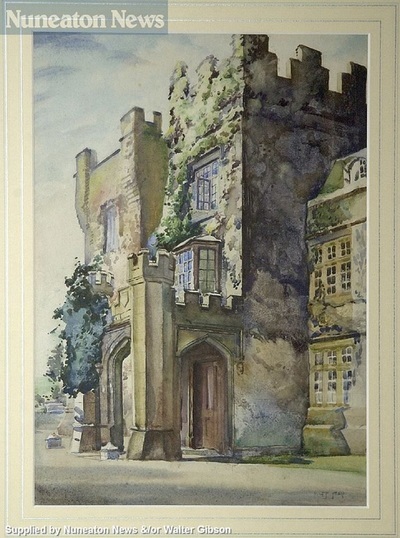 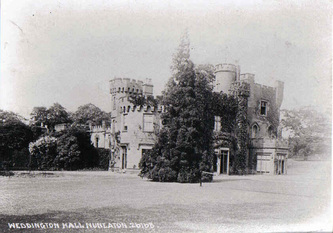 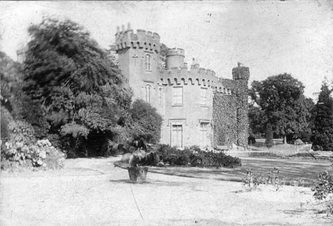 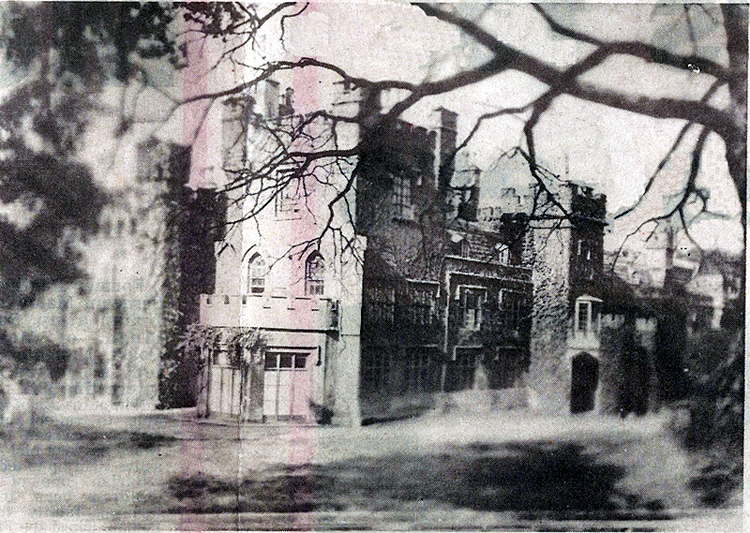 Weddington Castle, 1906. 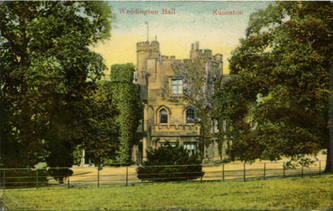 A rare colour postcard. 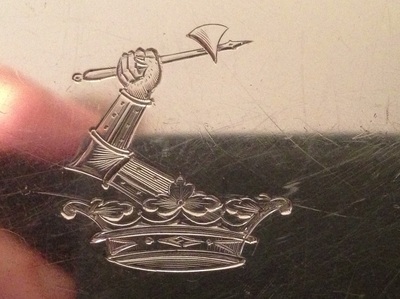 This type of heraldic animal is described as LION SEJANT (lion sitting upright on haunches) and was Gold (Or) in the crest (1) The Heming family motto is: Aut nunquam tentes, aut perfici - "Either do not attempt, or complete." 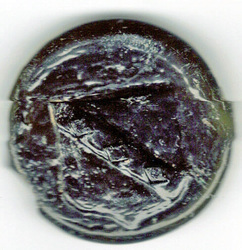 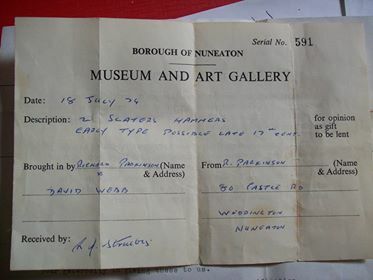 A piece of glassware found on Weddington allotments in 2009 by local resident Dean Dewis. This features the crest of the Adderley family from the late C17th. This is actually a glass wine bottle seal. 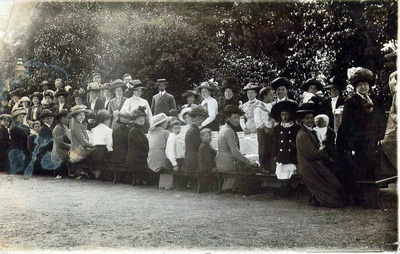 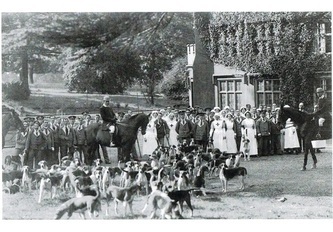 An Edwardian garden party in Nuneaton. 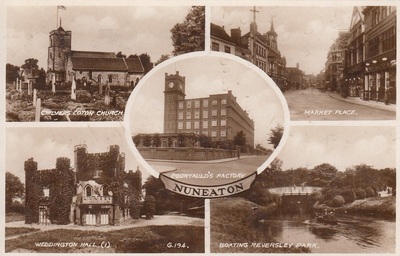 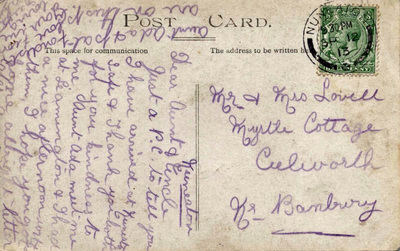 Postcard dates 1913. 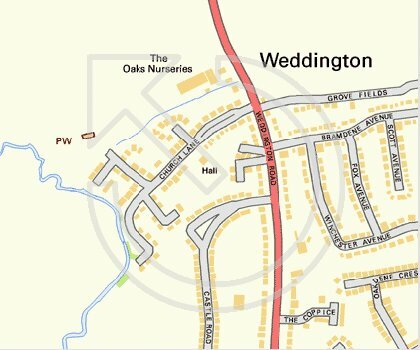 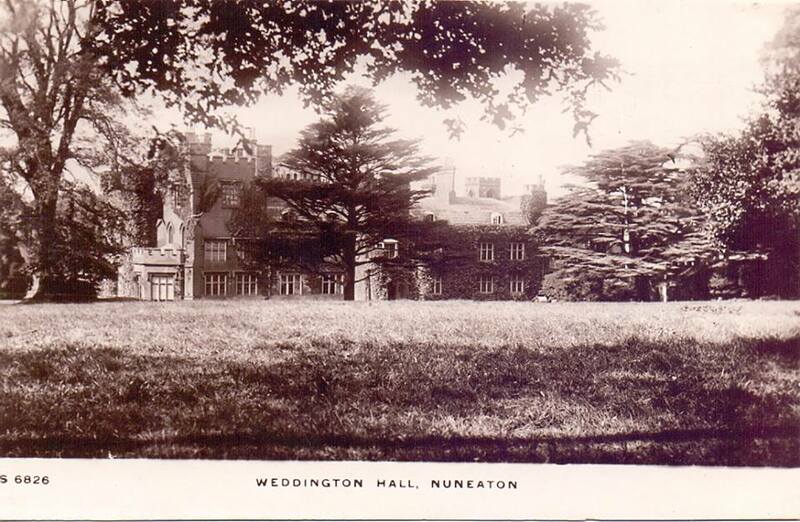 Could it be the grounds of Weddington Hall? 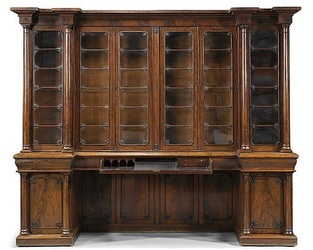 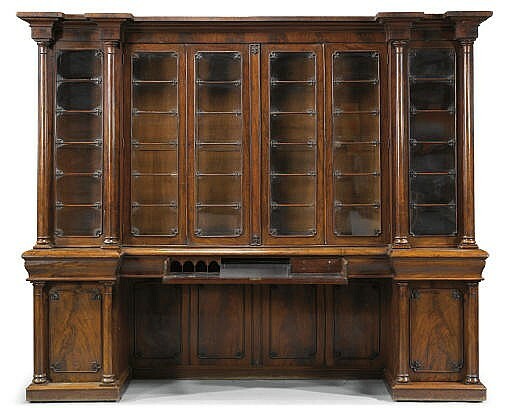 * This very same bookcase - dating from around 1835, went on sale at an auction at Christie's in 2007, selling for £8,750. 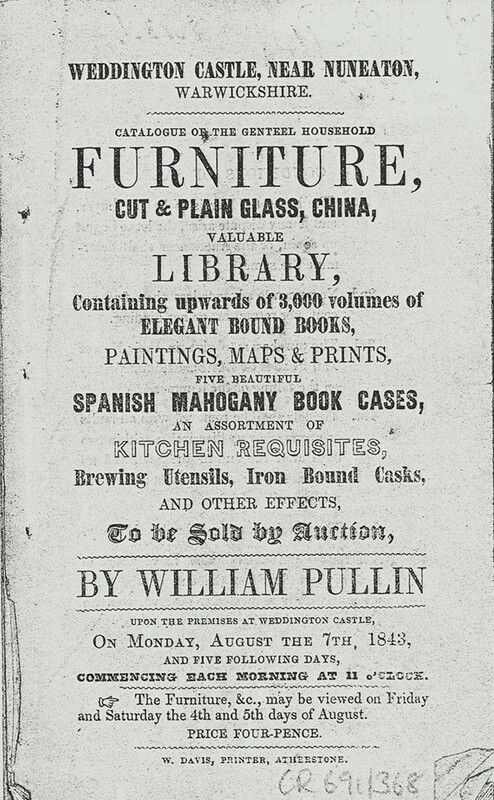 You can view details of the sale here. 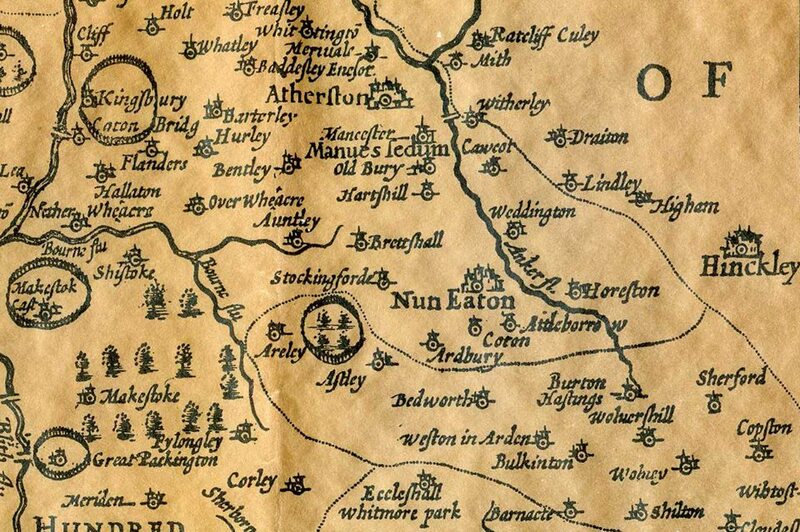 ** Ann Mowbray was an early Victorian lady artist who drew places around the country as she visited them. 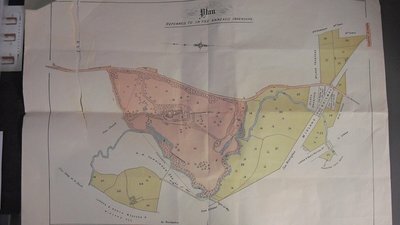 She came from Sussex. 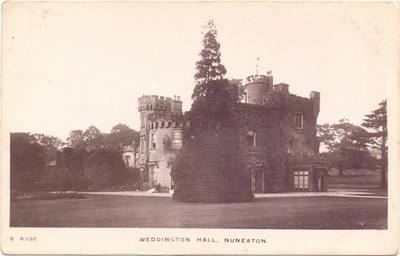 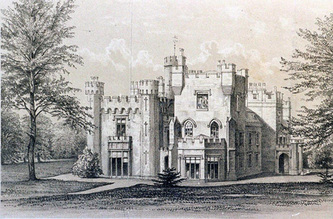 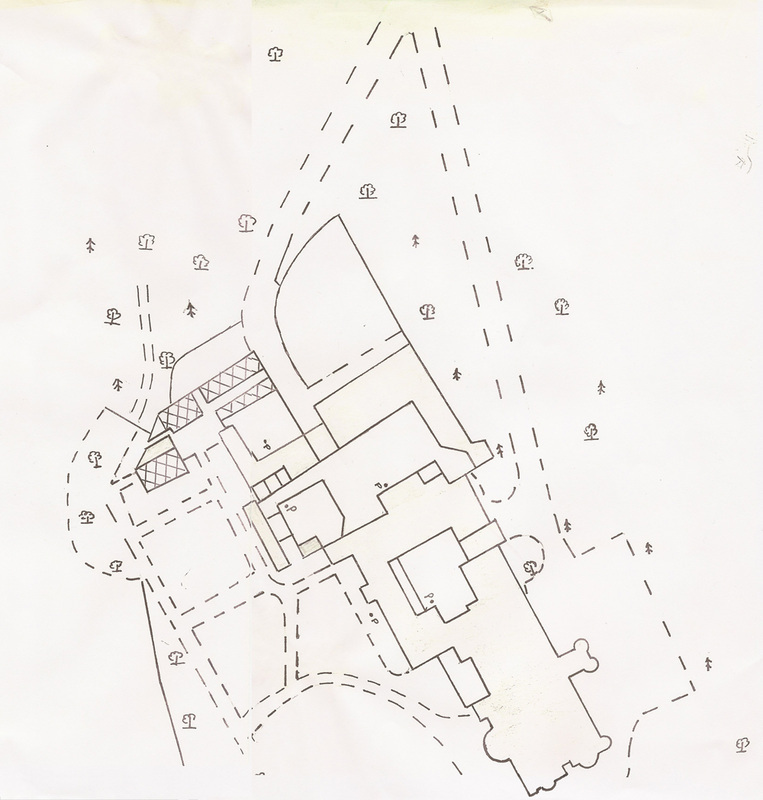 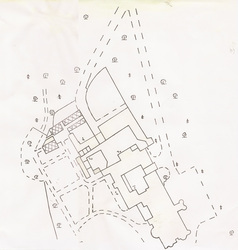 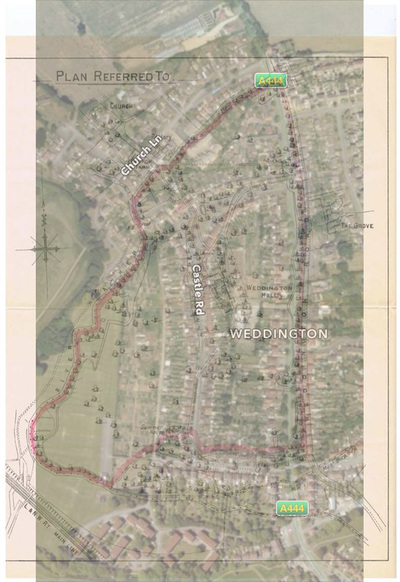 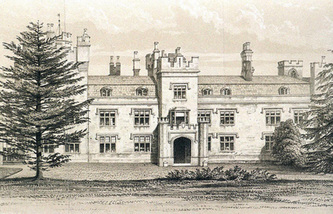 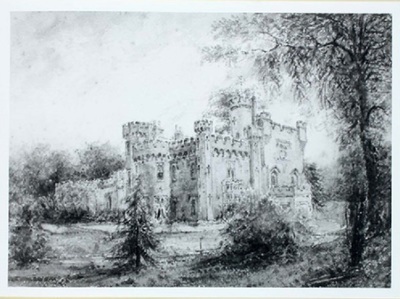 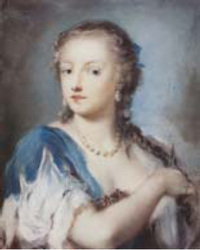 The Weddington Castle drawing is inscribed by her on the back as follows "Weddington Castle/South West/Nuneaton, Warwickshire. Lionel Place Esq. 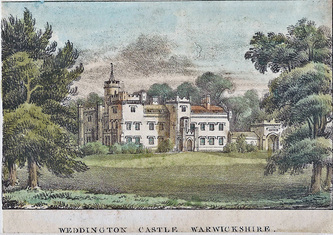 August 1831. 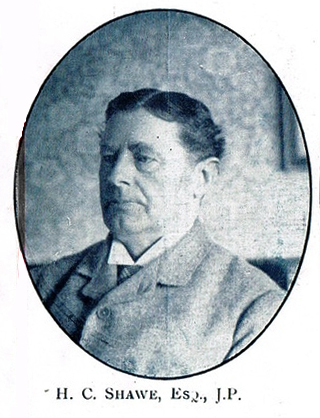 A Mowbray". The size is c. 5 x 7 inches. 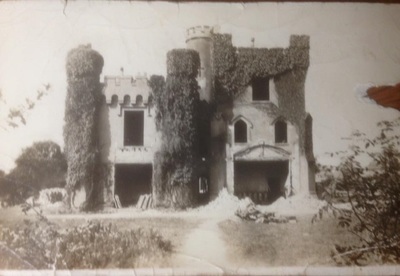 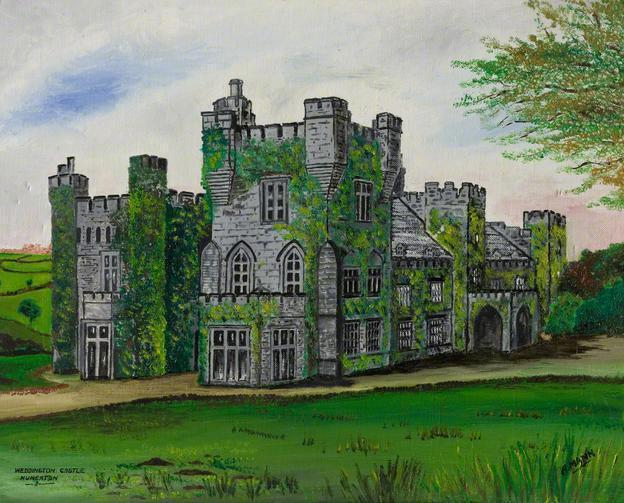 *** Grateful acknowledgements to Norman Cole and his daughter Rose Cole for saving and preserving this wonderful artefact of Weddington Castle. 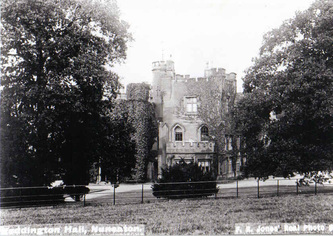 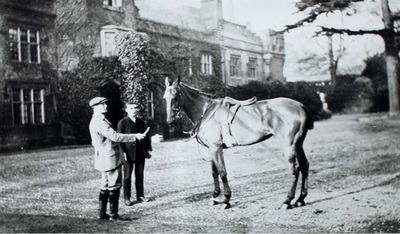 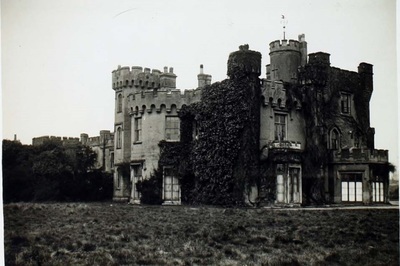 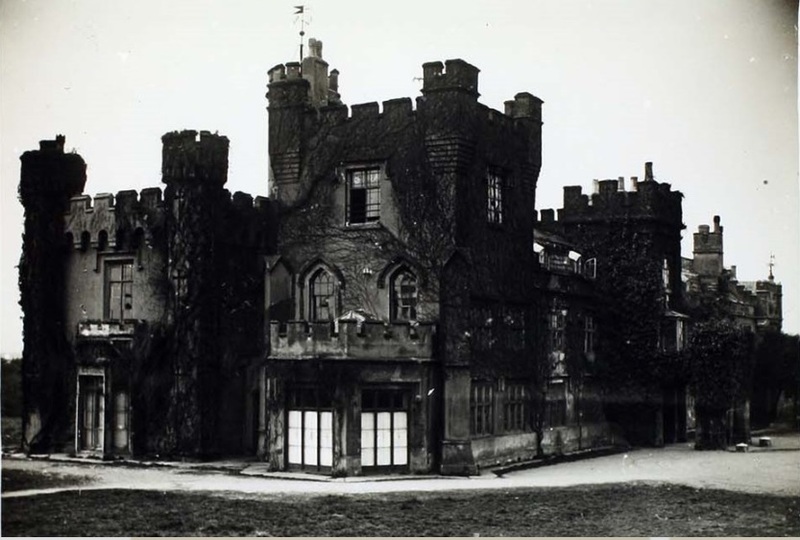 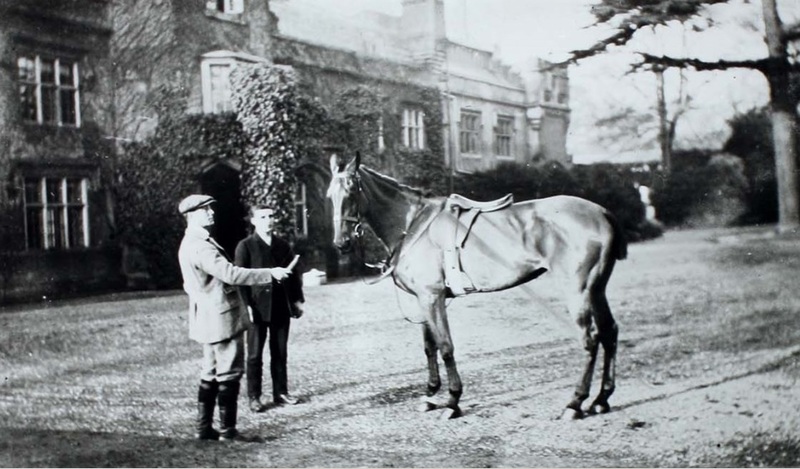 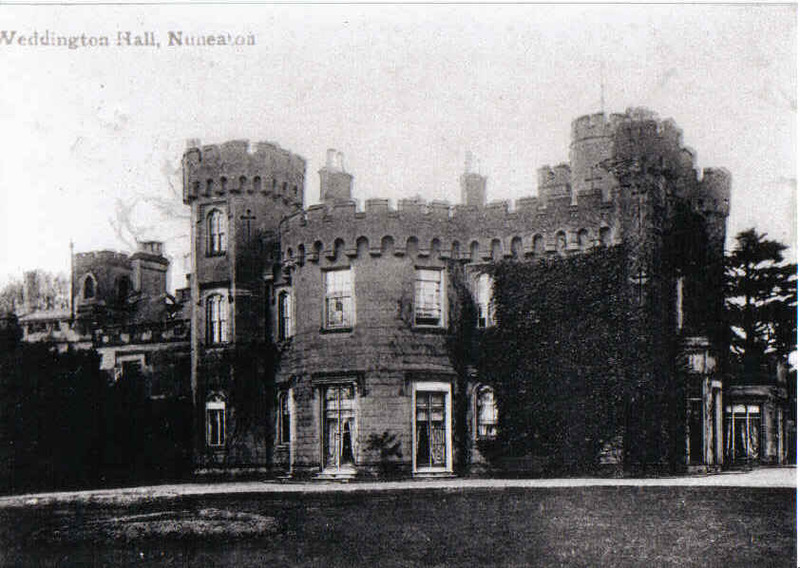 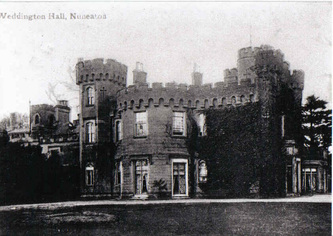 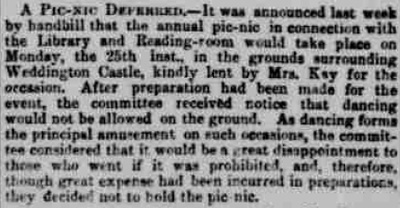 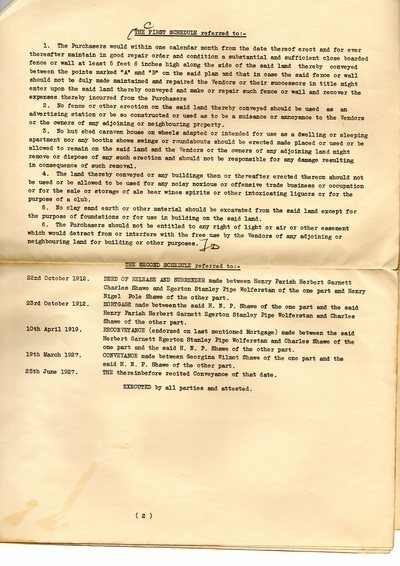 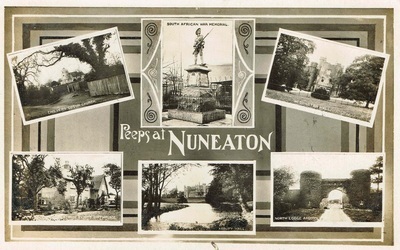 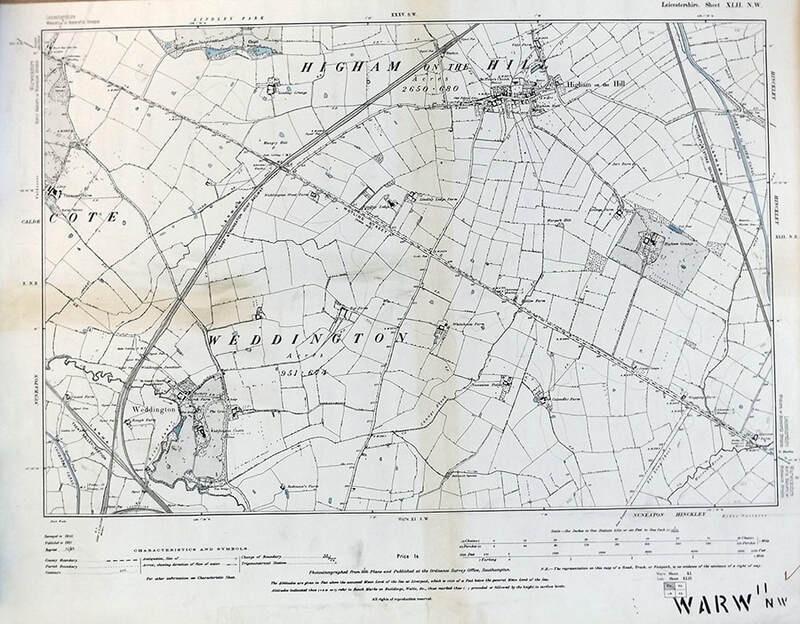 It was first bought when Weddington Castle contents were auctioned on 6th July 1928; Mr Joseph Henry Knight of 228 Weddington Road bought 2 lion statues for 5/- each (25p). 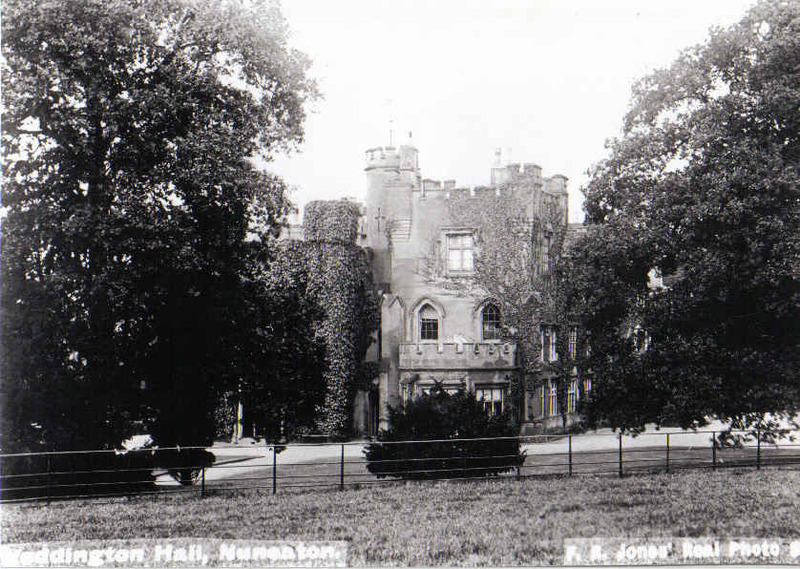 In mid-1943, Joseph Henry Knight died, and some of his possessions and items were auctioned from his house; a local miner Mr Norman Coles (of Shawe Avenue) bought one of the lions for similar money (12p-25p modern day money). 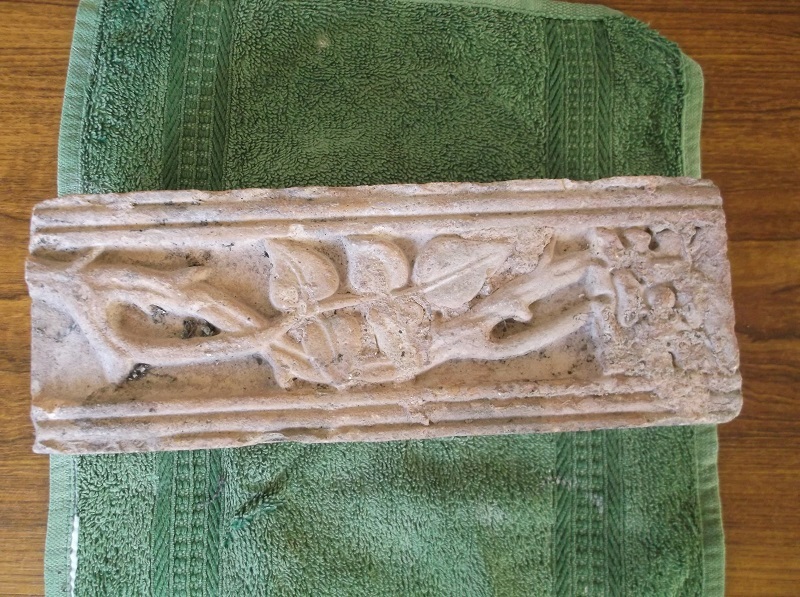 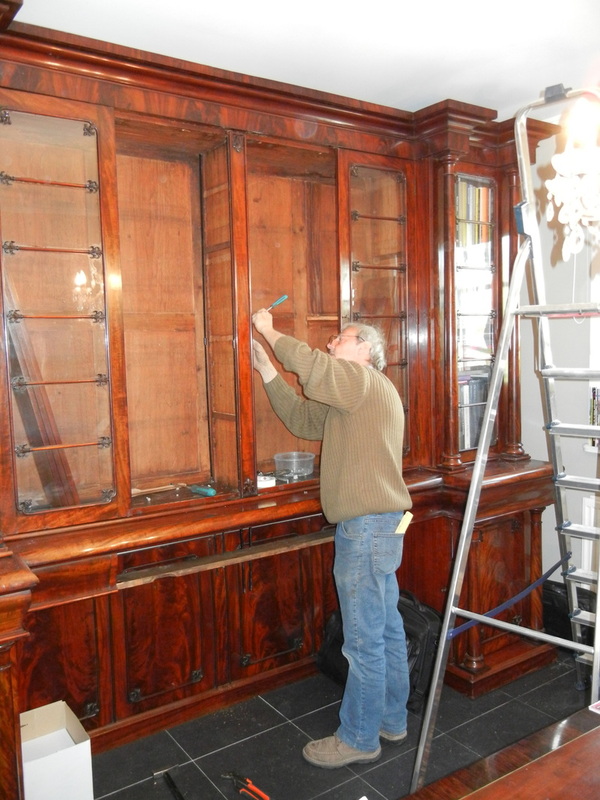 He kept this until he died, and his daughter Rosemary Coles inherited it some years ago, and she kindly donated it in 2011 for restoration and safe keeping. 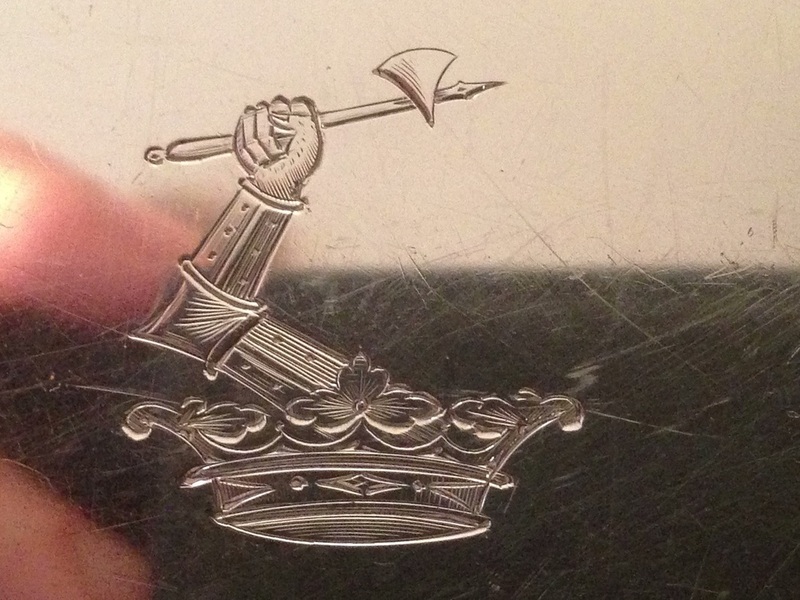 **** Many thanks to Richard Brown who sent this image to us, stating: "I have been carrying out some research about a crest engraved on a silver platter I inherited some years ago from my Grandfather. 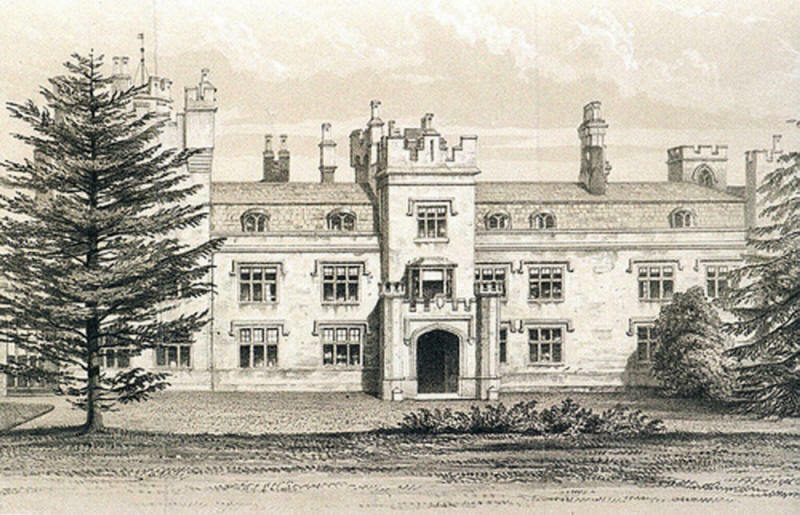 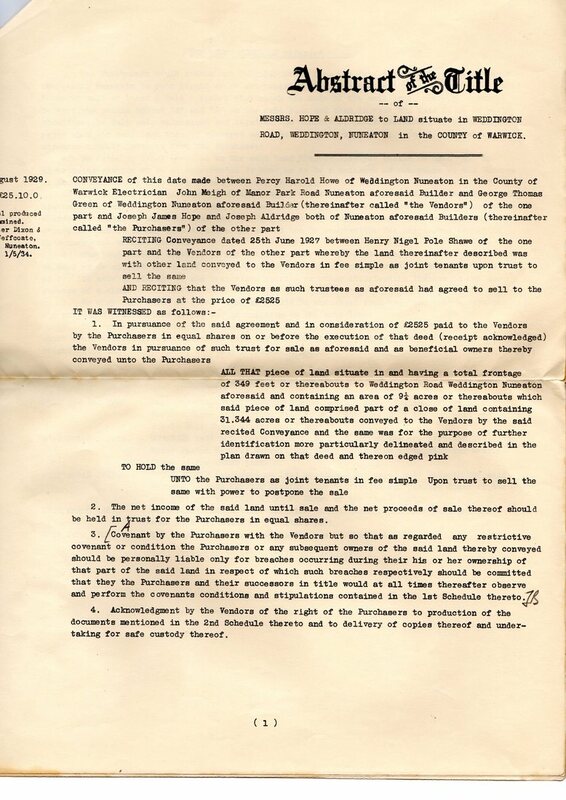 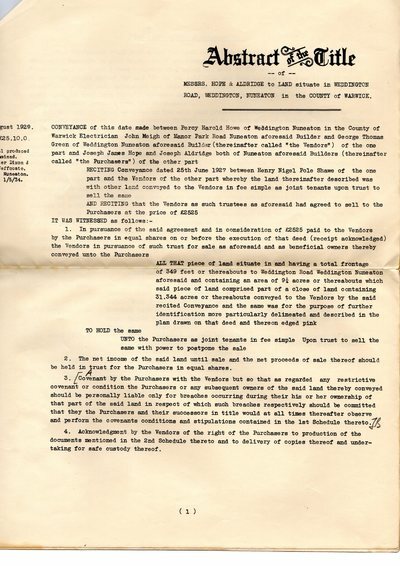 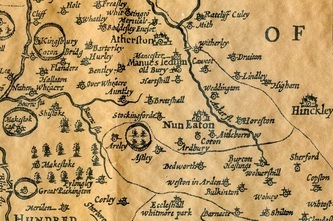 Place of Dinsdale in Durham and Weddington Hall in Warwickshire was one of two families with records linking them with a crest of this type – see attached letter from the Chester Herald". 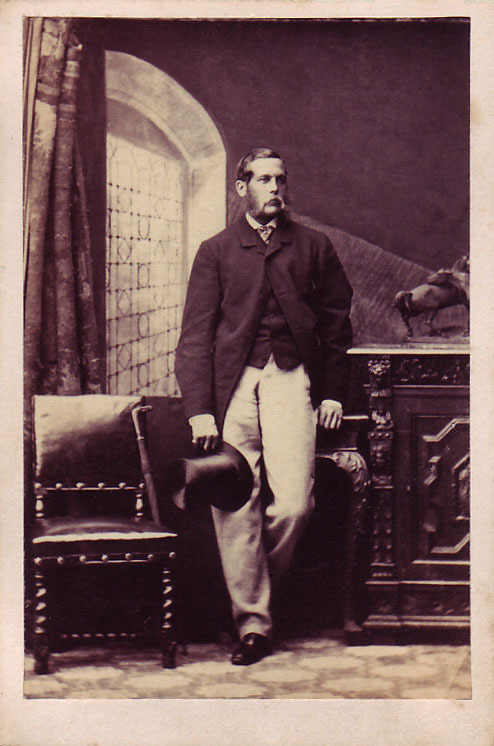 # Photos provided by Thomas Peeke in 2013, featuring his Great Grandfather, William Moore, then aged 27. 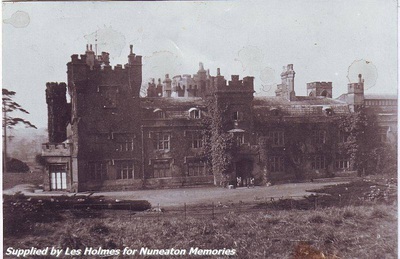 ## Photo submitted to the Nuneaton Tribune in 1987 by Mr C E Young of Tasmania, Australia. 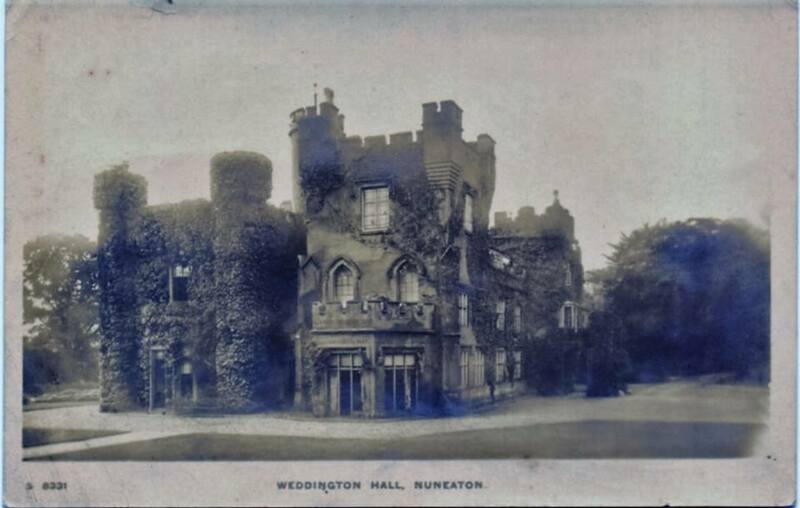 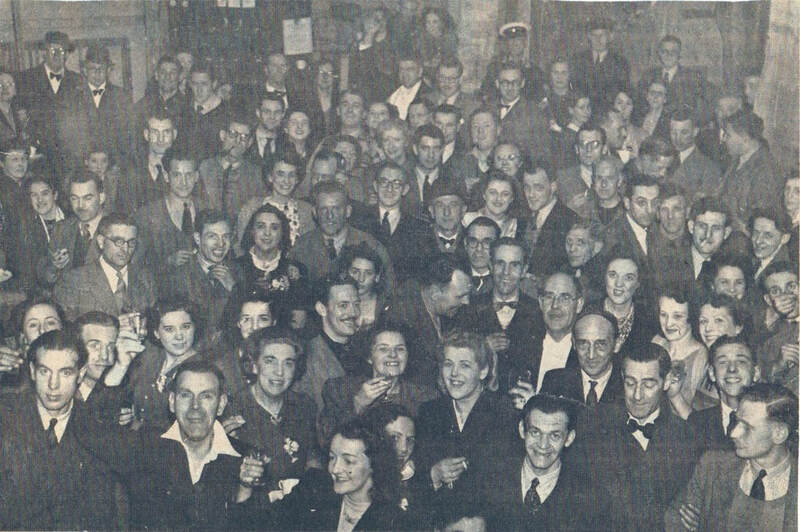 It was taken by his father, a keen amateur photographer and local resident. 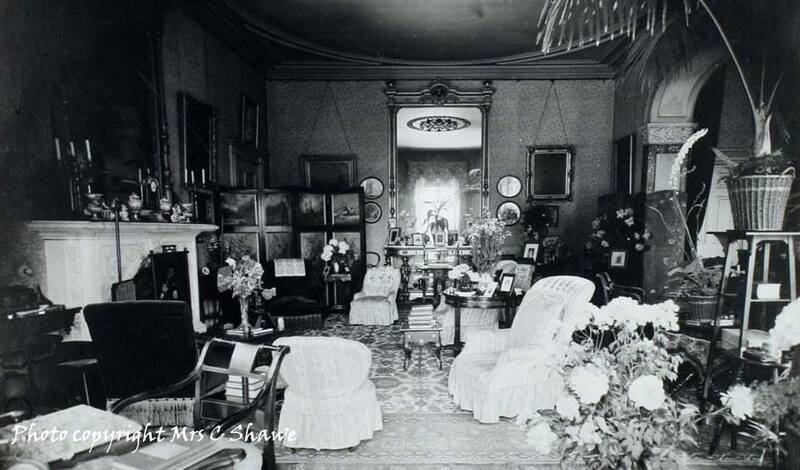 ### Read more about Captain Shakerley in a PDF document by clicking here. 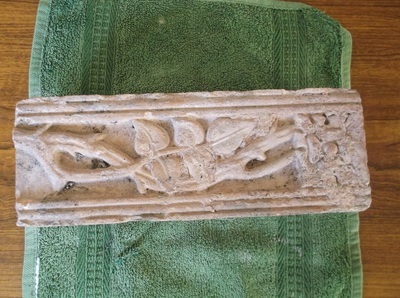 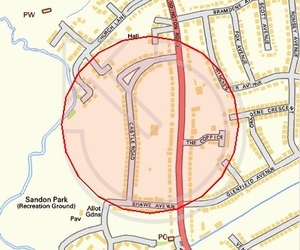 @@ Found by a resident of Castle Road. 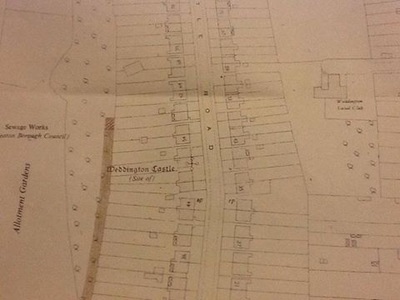 When they had their chimney breast removed to fit a gas fire, the contractor uncovered some old bricks which appear to have been used as common bricks in hidden areas of the house. 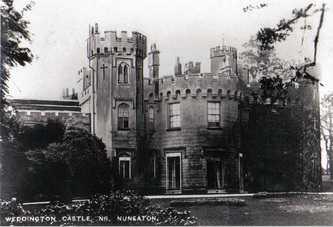 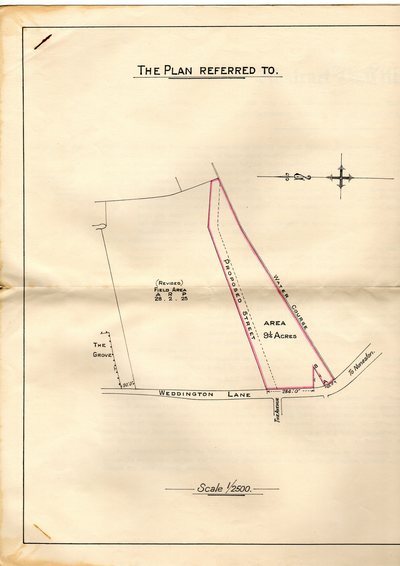 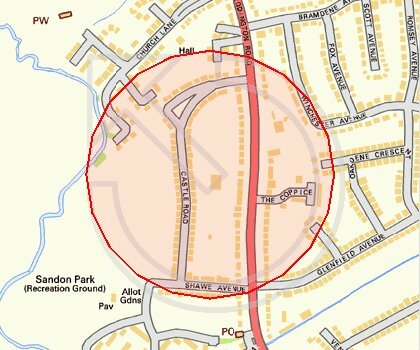 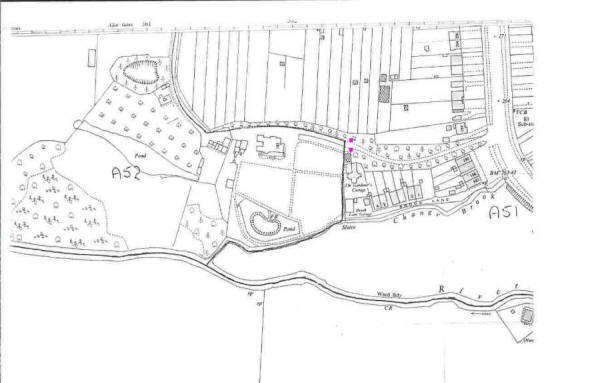 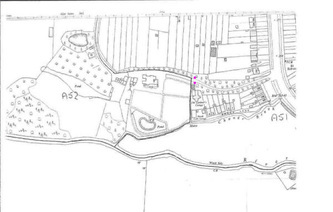 In view of the fact that the castle was in splendid isolation at the time it seems the likeliest place a heap of old bricks might have come from, so it seems highly likely that these were used on all the houses in Castle Road until the supply of old bricks ran out. 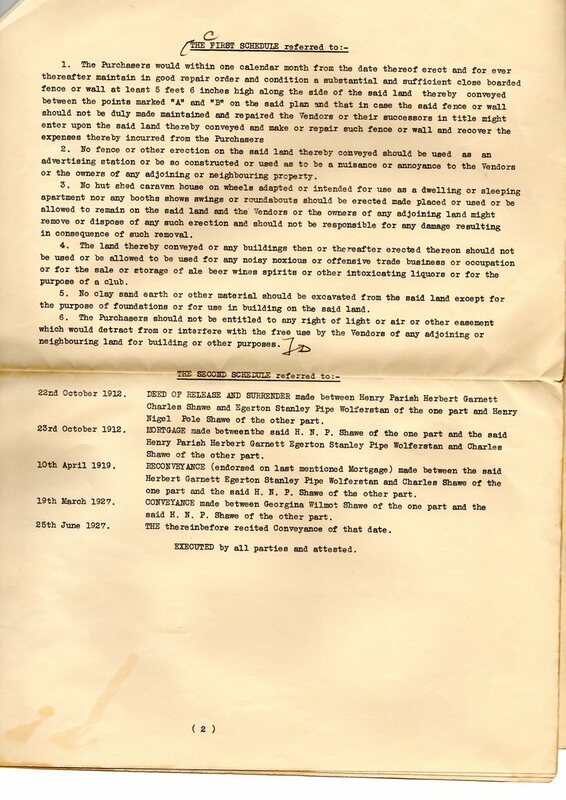 @@@ Courtesy of June Miller. 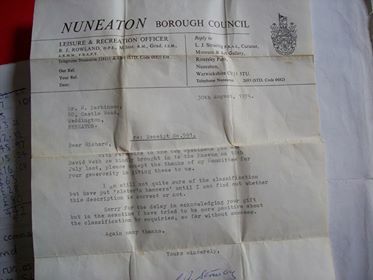 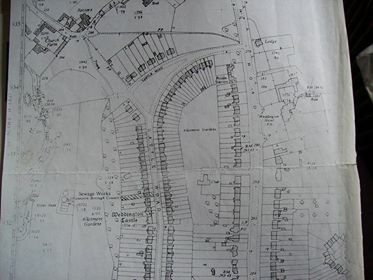 Posted on Nuneaton Memories Facebook page 2015, "Castle Road, my Father and a few others paid extra rates to have a road laid at the back of our houses in the 1960's and he also got permission to build a garage, unfortunately we left before that was realised. 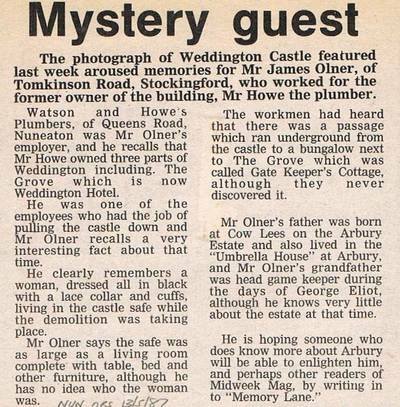 We lived at number 58."